Ampendage is pleased to announce that we are reducing the price of the Ampendage Amp Stand. Starting today, all models (teak, black and maple) will be available for $10 less. 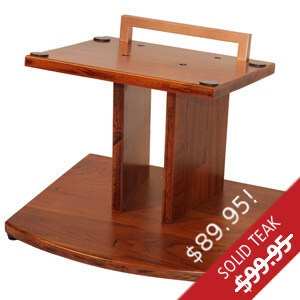 That puts the black stand at $59.95 and the maple and teak stands at $89.95 (plus shipping). We don’t know how long we’ll be able to maintain these prices, so order yours today. You won’t find better value in an amp stand anywhere!